For a general map of Peloponisos, click here!(40K). For a map of the Argolis area, click here(101K). 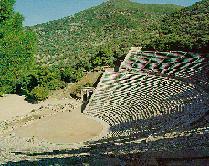 Epidavros is the site of a beautiful open air theater with wonderful sound characteristics. In use today (thats more than 2000 years of use!) it offers great performances, especially of ancient Greek tragedies. It sits 15000 people. Nearby there is a hotel for those tht just cant travel too far from a performance! This is a nice town, found on the foothills of an ancient volcano, which has direct contact with PIREUS with frequent ferry service. Methana is on a small promontory onto which are found other villages as well. A village right next to a weird geological phenomenon. Part of this vilage has sunk into the earth creating a large round chasm. On the edge of this chasm, little churches have been built and through a narrow pathway and stairs built on the sides, visitors can descend into it. A nice village, the site of the 'FRAGKI' cave. Found within the cave are paleolithic tools and skeletons and other mesolithic objects dating back to around the 10th-7th century BC. The village has also another claim to fame: it looks and feels like an island village and not like a Peloponese village. The main sector of employment is fishing. Wake up early and head for the port to meet the boats as they come in at around 8 am. You can then buy fish from the boats directly. A very beautiful village, in the south part of the Argolida peninsula. It has a lovely beach and tranquil sea, even when the Meltemi makes sea crossing difficult in August. Porto Heli, although very nice, is extremely touristy and should be visited off-season, May or October. Porto Heli is connected, using jet foils (aka 'Flying Dolphins') with Spetses, Hydra, Pireaus and other islands. A beautiful beach, exactly opposite the island of Spetses. 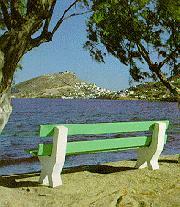 Used, believe it or not, by those on the island to spent a quiet time on a beach! This village, which has been built upon an ancient town of the same name, is proud to have a wonderful navy tradition. There is a temple devoted to God Poseidon, and the church of the 'Taxiarhon' where in 1827 took place the first meeting of the newly created Greece. A lovely little town whose claim to fame is a very shallow beach that is wonderfully warm in the summer for those that prefer sea 'baths' than actual swimming. The village was built in the early part of this century by Greeks arriving from the western part of Turkey during the population exchange that took place at that time. A nice village, about 700 meters up on Artemision mountain(peak at 1722 meters). Walking past the village we get to the 'Virgin Mary' monastery and a clear mountain spring. This is the perfect place to re-fill camping water containers and escape the mid-summer heat. A well known ancient site and the place where the Mykinean civilisation was based, about 1000-500 BC. 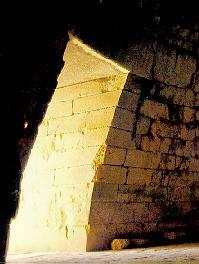 Tomb of Agamemnon. Not to be missed. 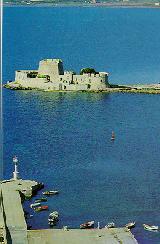 A village nera the north part of Nafplion near which, beautiful Mycinae tombs were found. Contents from one, which was a knight's armor, is now on display at the Nafplion Museum. A very interesting place that is the site of many huge boulders reminiscent of gaelic dolmens. The huge 'dolmens' must have been the sole creation of the cyclops (Kiklopi), huge beings who would have the strength to move them. Or so the locals believe. 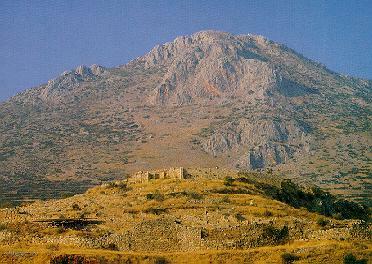 Tirinthia has been inhabited since neolithic times. 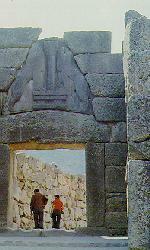 Around 1400 BC, the outer walls were created, a century before Mykinae. 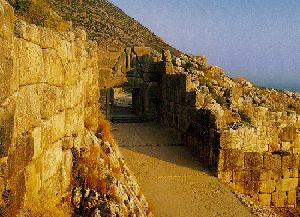 In the beginning of the 12 century BC, the town was burned, only to be rebuilt and occupied by the Dorians. 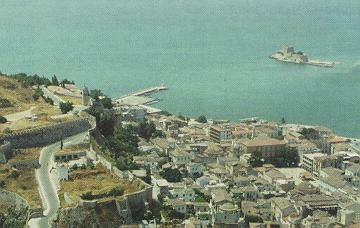 The main town in the area, believed to be the most beautiful city in Greece. 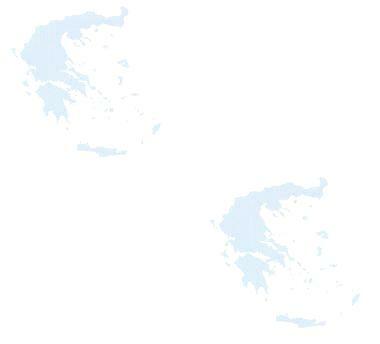 It used to be the capital, before transfering to Athens. This old city with neoclassical houses, picturesque streets, wooden balconies, Turkish fountains with its fascinating mosques and outdoor cafes, seems like a fairy land. Climbing 858 steps gets you to the fortress, Palamidi, built by the Venetians when they controlled in the arly 1500s. Situated between Nafplio and Epidavro, this village's claim to fame is a beautiful old monastery. Inside this monastery is a clear water spring which always supplies clear water as well as a small textile workshop. A nice seaside village, with the main beach a little removed from it (3 km/2 miles). 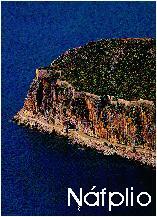 Many Mycinae tombs have been found here and even the Acropolis which is situated on a clifftop, dates back from that time. An exceptional lovely village with a beautiful beach, clear warm shallow water and a cluster of small offshore islands. It is worthwhile exploring the area even taking small boats heading for these little islands. Many have churches or chapels, and one of them even had a secret school used during the Turkish occupation. A place, which was unknown until recently. Its only claim to fame is the tasty artichokes that are produced in the nearby valley. Iria has become very touristy, especially during summer. One of the nicest monasteries in the Peloponese, now deserted. It has been built right on the edge of a gorge with the main church conctructed upon a huge rock.